Rangers fans have tomorrow’s cup clash with Cowdenbeath to look forward to following the winter break, and manager Steven Gerrard has confirmed new signings Jermain Defoe and Steven Davis WILL feature in the fixture, but would not be drawn on whether the January acquisitions would outright start the match. Rangers desperately needed firepower up front to support main striker Alfredo Morelos and more quality at the apex of midfield, so worked hard to secure both experienced pros in Govan. But speaking at his presser today, Gerrard wouldn’t confirm whether or not either will start, only that they would definitely play a role in the match. So unless we’ve wildly misinterpreted this as his saying they’ll be involved at some point this season, Rangers fans can finally get to look forward to seeing two of the winter recruits donning the shirt in earnest within 24 hours. Just don’t necessarily expect them in the starting XI. Get them in. Why would we wait. We need them to get in the team and get some minutes before our bigger challenges come up. 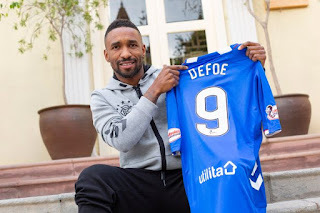 I suspect Defoe will start , Alfie will want to play some part agai Helsinki on Sunday.